Season's Greetings from Malawi. Christmas, and the rains are finally upon us! For two days it's been raining incessantly here, not as pretty as snow, but in a parched Malawi very much more useful. Our week has been dominated by our annual Christmas shopping expedition, whereby forty children between the ages of three and fourteen get to go to our local PEP 'Superstore' to choose their new Sunday best outfit, which will get its first showing on Christmas Day. Huge thanks go to the students and staff of Kingswood School, Bath, who have financed the shopping this year, largely by 'bagging up' in the supermarkets of Bath on Sunday afternoons. We have had a successful year. Two new buildings have been added to our portfolio, one of them a purpose built computer lab funded and partially built by the staff of Travelzoo, a global internet media company. The second was the seventh in our long line of Nursery Schools and Feeding Stations, built by a stream of volunteers from various institutions from both sides of the Atlantic, but funded by Johnson and Johnson International. Both of these welcome additions have had a great impact on the children who benefit from them. No less than 28 children have been returned to their extended families from Blantyre, and a further 11 from Mangochi make this a record. Their places have been easily filled, and we still have approximately 100 children in residence between the Foster Houses and Blantyre and Mangochi infant homes. Tough economic times in Malawi have made it necessary to award significant pay-rises to our 100 or so local staff. This has only been possible because of the continued generosity and concern from our donors around the world. We wish them all, and we wish you the reader, a very enjoyable and happy festive season. 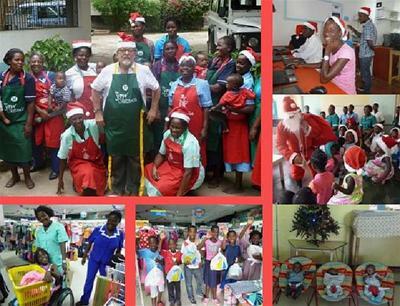 Special thanks go to Morrisons supermarkets for the provision of festive aprons and hats! With very best wishes from all Open Arms staff in Mangochi and Blantyre.